Find artworks, auction results, sale prices and pictures of Netty Michels at auctions worldwide. 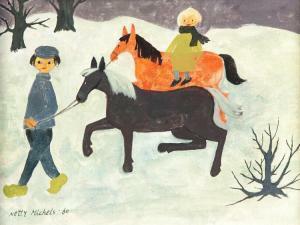 Description: CHILDREN BY NETTY MICHELS (DUTCH, MID 20 TH CENTURY). Oil on canvas, signed lower left. Winter scene with two children and horses. Small repair. 12"h. 15.75"w., framed, 13"h. 17"w.